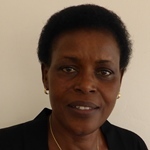 Jeanne is an independent Rwandese consultant and has been working with local and international organisations on gender, conflict transformation and peacebuilding since 1995. Jeanne is conducting research in Rwanda for ESID’s research project on Gender and the Political Settlement. Jeanne is the national trainer for women candidates for parliamentary elections and is presently working as a consultant with the Ministry of Gender and Family Promotion Mentorship Programme and Women’s Leadership. Jeanne is also Chairperson of Pro-Femmes Twese Hamwe, an Umbrella of 61 organisations working on gender issues (including health, leadership, entrepreneurship, education, women‘s rights) as well as the Vice-Chairperson for the Great Lakes Region initiative in peacebuilding COCAFEM/GL (Concentration des Collectives et Associations Féminines de Grands Lacs). Jennie E. Burnet and Jeanne d’Arc Kanakuze (2018). ‘Political settlements, women’s representation and gender equality: The 2008 gender-based violence law and gender parity in primary and secondary education in Rwanda‘. ESID Working Paper 94.